WHAT IS IT? Well I’m not inspired by just one flag, but I thought I show you where I come from and did a Hello Europe mani working with all the flags that are not too difficult and easy to recreate. So I chose: of course the flag of the EU, then Germany, Italy, the Netherlands, France, Sweden, Irland, Spain, Finland and Portugal. WHAT IS USED? All are painted free hand and the colours are: White: Pro French Tip Whitener from Manhattan, Black: 677 Black out from Maybelline, Green: Style Proof Blogger Edition 08S by Manhatten, Blue: 98 Walk on air by essence, Red: 92 better late than never by essence, Orange: 33S from Manhattan, Yellow/Gold: Catrices’s 630 Goldfinger. HOW DOES IT FEEL? 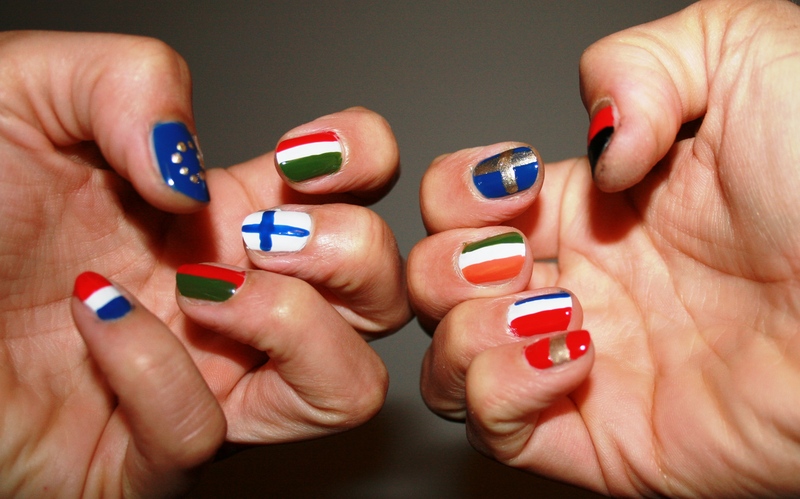 It is a great mani for celebrating the European Union but well this would need a special day or as in my case the only time that I usually paint my nails with the German flag: Soccer World or European Cup. But that has time till next year. Then I might consider this mani again. Compared to yesterday’s mani you might understand, why I prefered to keep my dragon nails a bit longer. This entry was posted in Nail Art and tagged 08S, 11A, 31 day nail challenge, 33S, better late than never, black out, Catrice, essence, goldfinger, Manhattan, Maybelline, Nailpolish, walk on air by kathatravelling. Bookmark the permalink.